We collect raw human hair material from single healthy donors. Strong weft guarantees no shedding of bundles. 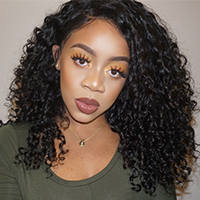 Because each bundle is made with human virgin hair with cuticles aligned in the same direction, so there will be no tangling, the hair texture is so soft and silky, which gives you a more natural hair look. Each bundle weighs about 100g and looks very thick, so 3 bundles are very enough for you to achieve a full look. If you have your own salon and hair store, we can offer cheap wholesale price for you.